OBJ Viewer is a simple tool to view files in the .OBJ format on Mac OS X.
OBJ Viewer lacks support for automatic smoothing. Specifically, it will not respect s directives in the input file, although it will correctly process vn directives. OBJ Viewer lacks support for textures. OBJ Viewer does not display shadows. OBJ Viewer does not support the bevel, call, csh, curv, curv2, c_interp, d_interp, l, lod, p, or surf directives. There are a number of other minor features of the OBJ file standard that OBJ Viewer lacks support for. 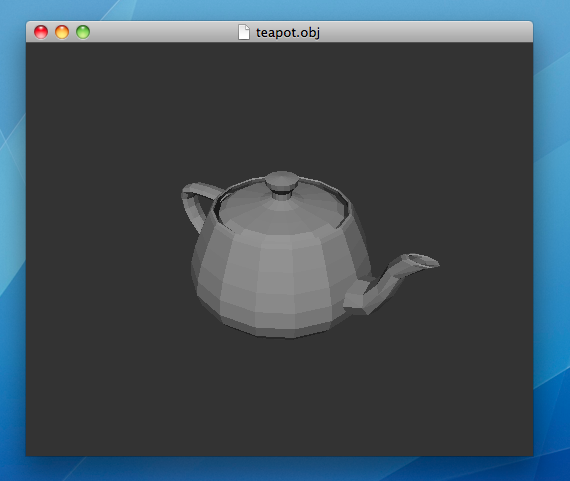 OBJ Viewer is available for download here. It should run on Mac OS X 10.6 or later (but no guarantees).